Throughout time, humankind has been attracted to shelters and the dark mysteries of caverns, or caves. Much of the early evidence of humans and their art comes from archaeological sites in caves. Most solutional caves were formed as weak carbonic acids in groundwater dissolved solid rock, especially carbonate rocks (limestone and dolomite) and salt deposits. Caves have rarely formed in sandstone or shale because minerals such as quartz, feldspar, and clay do not react readily with carbonic acid in water. Coppingers Cave in east-central Tennessee is a solutional cave in an area of karst topography. Dripping and flowing water creates its features, such as this flowstone. Carbonic acid is the result of the atmospheric gas carbon dioxide (CO 2 ) reacting with rainwater. When the rainwater enters the soil, it may pick up even more CO 2 from the organic material present. The water continues to infiltrate downward until it reaches the saturated zone of the water table . Along the way, the water may create openings in the rock where water dissolves soluble minerals. Groundwater flowing through cave systems represents the only true example of so-called "underground rivers;" otherwise, groundwater occurs not in subsurface "rivers" or "lakes" but in small spaces (pores) in rocks and sediments. Caves can form by various mechanisms, and can fall into various categories such as solutional caves, lava tubes, talus caves , soil tubes, glacier caves, wind caves, sea caves, and tectonic caves . Solutional caves form by the dissolving of rock above or below the water table. If a cave occurs above the water table, water dripping from the roof of the cave may precipitate dripstones. 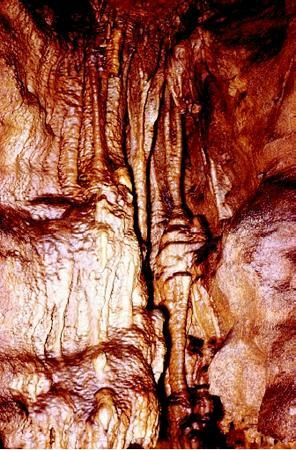 Two of the most common dripstone deposits are stalactites and stalagmites. Stalactites form like icicles as minerals slowly precipitate minerals on the ceiling. Stalagmites grow upward from the cave floor where the drops of water land. Eventually, a stalagmite and stalactite may grow together to form a column. Water flowing over the surface of a wall or floor deposits layers of calcite called flowstone. If the cave forms below the water table, as most caves do, no air is present for the water to drip through; therefore, drip-stone and flowstone do not form. In areas where extensive limestone formations occur, numerous sinkholes may form an irregular land surface called karst topography. Although karst topography is characteristic of humid areas, few surface streams are present because of the underground drainage channels. Sinkholes also form in areas where underlying layers of evaporite minerals (halite and gypsum) dissolve. Evaporites are the most soluble of common rocks. Groundwater rapidly dissolves them and carries the dissolved minerals off in solution. Such high solubility enables subsurface channels and sinkholes to form in a few days, weeks, or years, and catastrophic collapse can result. The Wink Sink of west Texas is an example of a recent sinkhole in salt deposits. In some areas, caves that were above the water table have been drowned by the rise in sea following the end of the ice ages . The sinkholes providing entrance to these undersea caves are called "blue holes," named for the blue sea water filling them. They are found in Florida, the Bahamas, and other similar areas, and attract adventurous cave divers. The drowned caves often contain stalactites and stalagmites formed thousands of years ago when the caverns were above sea level. These caves may be filled with salt water, fresh water, or both. Two of the largest caves in the United States are Mammoth Cave in Kentucky and Carlsbad Caverns in New Mexico. Both consist of passageways dissolved in limestone. Mammoth Cave is believed to have formed by carbonic acid in water slowly removing limestone, whereas parts of Carlsbad Caverns may have a different origin. In 1980, speleologists (people who study caves) proposed that at least part of Carlsbad Caverns was formed from the bottom up. Hydrogen sulfide, a gas ascending from deep petroleum reservoirs , dissolved in groundwater to form sulfuric acid that dissolved huge volumes of rock at the levels of the ancient water table. The added power of this acidic water explains the depth and size of the passageways. Mammoth Cave is the longest recorded cave system in the world with more than 500 kilometers (310 miles) explored and mapped. At a depth of 486 meters (1,594 feet), Carlsbad Caverns is the deepest cave in the United States. The large room at Carlsbad Caverns is 1,200 meters (3,936 feet) long, 200 meters (656 feet) wide, and 100 meter (328 feet) high. SEE ALSO Fresh Water, Natural Composition of ; Fresh Water, Physics and Chemistry of ; Groundwater ; Karst Hydrology . Harris, Ann G., and Esther Tuttle. Geology of National Parks. Dubuque, IA: Kendall/Hunt Publishing, 1990. Hill, Carol A. Geology of Carlsbad Cavern and other Caves in the Guadalupe Mountains, New Mexico and Texas, Issue 17. Socorro, NM: New Mexico Bureau of Mines and Mineral Resources Bulletin, 1987. James, Noel P., and Philip W. Choquette, eds. Paleokarst. New York: Springer-Verlag, 1988. Martinez, Joseph D., Kenneth S. Johnson, and James T. Neal. "Sinkholes in Evaporite Rocks." American Scientist 86 (1998):38–51. Cave Facts: Information on Caves, Karst and Groundwater. American Cave Conservation Association. <http://www.cavern.org/ACCA/ACCA_index.htm> . * See "Karst Hydrology" for a photograph of the famous Winter Park, Florida sinkhole. I am Msc student that researching about(((( Role of Petroleum deposis in development of karst and influence of related process on quality of karst spring system......) Can you help me?? Iam studying caves and caverns and dont know.....What is the difference between a cave and a cavern?